"Currently, 70.34% of S&P 500 components are above their 50-day moving averages. Last week, this ratio hit 75%, which represented the highest such reading since late January, when major indexes last hit records." The 50-day moving average appears to be key for this pullback. The S&P 500 Index traded below initial support (horizontal green line) and then reached its 50-day average line and closed the week right at that line. On Wednesday the SPX and most of the major indexes rallied back up to that initial support line but then collapsed and closed below the 50-day line. Wednesday was a bearish outside reversal day. These occur when the market trades higher than the previous day's highs and then closes lower than the previous day's lows. Very bullish intra-day sentiment is suddenly reversed and all the gains are erased. Though that reversal day was followed by gains on Thursday, Another rally on Friday also collapsed and most of the early gains were erased. On Friday the SPX closed lower than it opened. Last week we wrote: "This does not mean we are at a top as records are broken all the time, but it does mean we need to follow all sell signals immediately. One of them could be the one that is the start of a bear market." The end-of-day selling on Friday was a bit ominous. This comes after the bearish outside reversal day on Wednesday and investors have the entire weekend to think about it. That said, the July 4th week is usually a bullish one. Obviously if a typically bullish holiday week does not end with gains, that would likely point to lower lows ahead. Another bearish indicator and possibly the most important is the NYSE Advance-Decline Line. 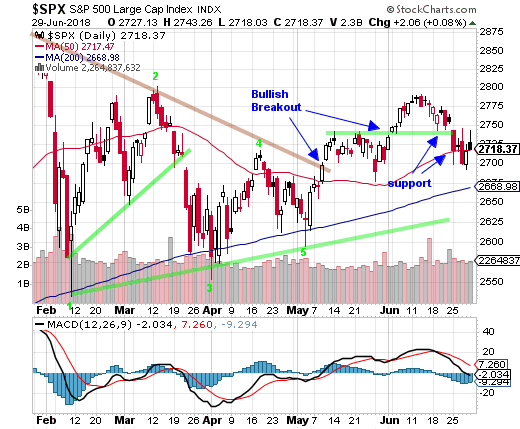 Last week we wrote that the line had turned lower but a single bad week, while a concern, did not point to lower lows.